The worst feeling if you're a parent is when your child get sick. You have no control of what is happening around you. You'll get paranoid googling symptoms, complications and contraindications regarding impression and diagnoses concerning your child. You would experience anxiety attack and pray that its nothing serious to worry about. I remember when my kid got hospitalized when he was still a baby (he was 7 months old) and was diagnosed of Dengue fever. There was no medication given except for some paracetamol , IV hooked for dehydration and every 6 hrs blood extraction to check his platelet count. His confinement lasted for a week. But after 20 years he was admitted for the same diagnosis, (Dengue) this time it was aggravated with chills, rashes all over his body, and blackening of bednails. The worst part is I was not around to comfort him. I was abroad. I was terrified and prayed the whole time. He was discharged after 2 1/2 week of admission. I am still afraid of Dengue and its complication and wishing that there would be a vaccine soon. Watsons, the leading health & beauty chain in the Philippines, announced the availability of dengue vaccination (Dengvaxia) in select Watsons stores nationwide. 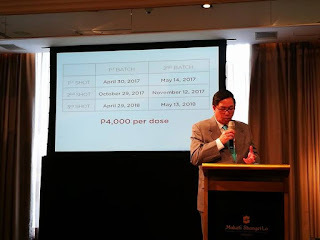 Watsons PH recently launched Dengvaxia on March 31 at Makati Shangri-la . The launch was attended by Danilo Chiong, Director for Watsons Trading Health, Dr. Rontgene Solante, Ms Sai Pascual, Senior Manager for Watsons Trading Health, Vicki Encarnacion, Watsons Marketing Director and Dr. Jez Lazaro, and media. 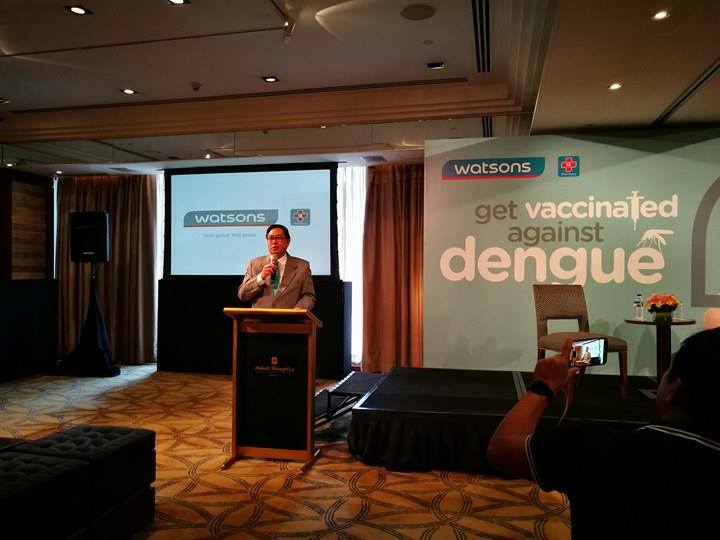 Watsons is the first retailer to offer Dengue vaccine to the public. The dengue vaccination was launched in the country by the Department of Health (DOH) together with the Department of Education (DepEd), and later on was made available in medical clinics last year. Watsons Trading Health Director, Mr. Danilo Chiong. The dengue vaccination, to be taken in three doses at 0 - 6 - 12 months interval, can protect the individual from all four strains of the dengue virus. This can be administered to people aged 9 to 45 years old. 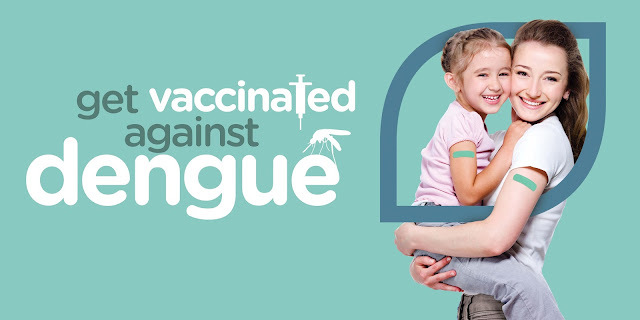 The dengue vaccination is the latest addition to the vaccines offered by Watsons. 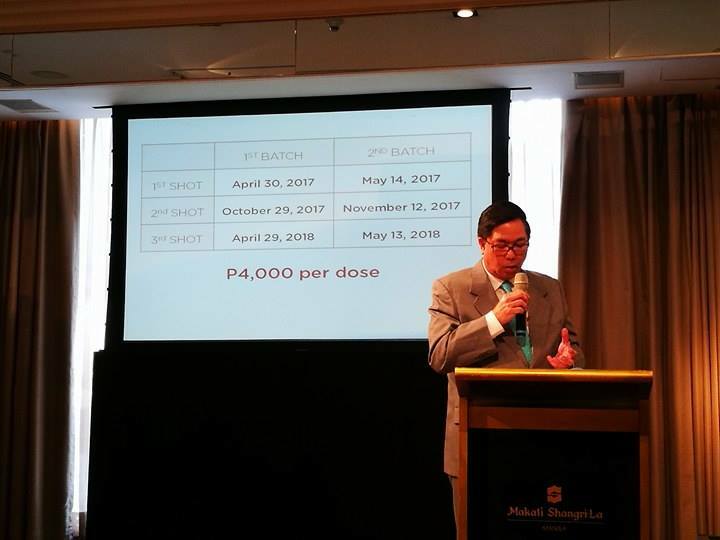 It will cost P4000 per dose or P12000 for all 3 doses, which is a reasonable price given the high incidence of dengue and high cost of treatment in the Philippines. 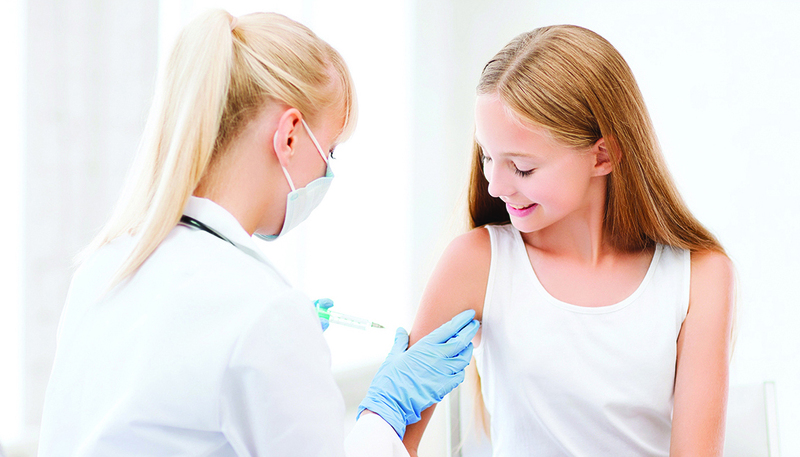 “Watsons also offer Cervical Cancer, Flu and Pneumonia vaccination at scheduled intervals throughout the year. We will have a doctor in store during vaccination dates to administer the vaccination”, adds Mr. Chiong. Second scheduled dengue vacation will be on May 14, 2017 (1st dose), November 12, 2017 (2nd dose), May 13, 2018 (3rd dose). This will be available in more than 100 stores nationwide.